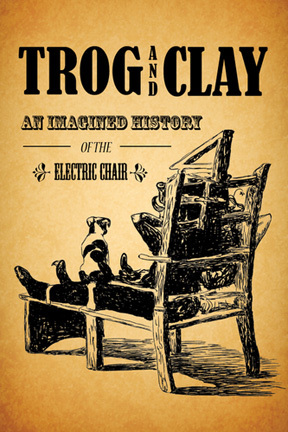 "Trog and Clay: An Imagined History of the Electric Chair"
Next up from Fresh Ink Theatre is Michael Vukadinovich's "Trog and Clay: An Imagined History of the Electric Chair." Directed by Lizette M. Morris, the production will play from April 27 - May 12 at The Factory Theatre, located at 791 Tremont Street in Boston. In "Trog and Clay," two foolish, philosophizing hobos unwittingly get swept up in the epic war of currents between George Westinghouse and Thomas Edison. While Westinghouse is trying to hold onto his scheming wife who wants to be an actress, Edison is using her to get a man executed. Meanwhile, a romantic wife-killer stands trial. "Trog and Clay" is based on actual events, absurd court transcripts and a little imagination. The cast includes Cameron Beaty Gosselin, Louise Hamill, Mikey DiLoreto, Renée Rossi Donlon, Terrence P. Haddad and Chris Larson. Writer and director Michael Vukadinovich is the recipient of multiple honors, including the 2007 Samuel Goldwyn Screenwriting Award. His work has been staged both nationally and internationally. For tickets and information, visit freshinktheatre.com.